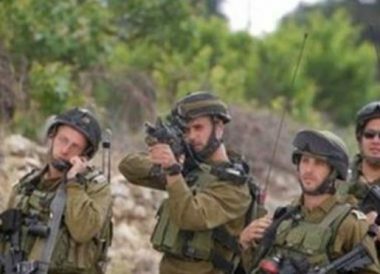 Israeli soldiers invaded, on Friday afternoon, ‘Atouf village, southeast of Tubas, in northeastern West Bank, and attacked a nonviolent procession, wounding three Palestinians, and abducted three others, including a reporter. Media sources in Tubas said dozens of soldiers invaded the village and used excessive force against the protesters, in addition to firing live rounds, rubber-coated steel bullets, concussion grenades and gas bombs. They added that the soldiers abducted three Palestinians; two of them identified as independent journalist, Zeid Abu Arra, in addition to the head of the Public Relations department of Tubas Governorate, Adham Abu Odah. The soldiers also shot three Palestinians, and caused dozens to suffer the effects of teargas inhalation.